As part of its ongoing commitment to building a “Data Strong” network, T-Mo has stated that it will be upgrading several 2G areas to 4G/LTE before the end of this year. This move joins others like building up wideband LTE in major metro areas, and rolling out 4×2 MIMO in others to offer the best, fastest network available. However, the 2G to 4G upgrade is by far – in my mind – of biggest importance. After all, there’s no use having the fastest network if it’s only available in the big cities and not anywhere else. We’ve been informed by many readers over the past few weeks of new LTE and HSPA sites going up along major highways, but today we’ve been told of something a little more exciting. According to our source, T-Mobile has applied for permits in the Wilson County, Floresville, Texas with the aim of completing tower upgrades in that county, and statewide over the next few months. The upgrades will be underway soon, and should be completed by December, unless there are any major technical issues with the rollout. These upgrades are specifically to upgrade 2G in more rural areas to 4G, giving a much faster network to those who currently have only EDGE (at best). Of course, it’ll more than likely be some time before the 4G in rural areas comes close to the blazing 20+20 networks in Houston and Dallas, but I’m sure the residents won’t mind, as long as they’re finally getting some 4G action. Those of you in the Wilson County area, in Floresville, be on the look out for HSPA and LTE over the next couple of months and let us know if you spot any changes in network availability. UPDATE: Having heard back from a source following a little more investigation, it appears this might not be the case. In short: It might be a 2G to 4G upgrade, but it might not be. Only time will tell if this area gets a network boost. “our county doesn’t require any permits for repairs or upgrades, only for new tower construction. Portland, TX is literally 5 miles from Corpus Christi, TX (4G LTE) and most of the reception is Edge… If that. Absolutely terrible service in a small affluent suburb. literally and not figuratively then? Rich people are too superficial for cell towers. Very true.. but not just “rich” – Often medium to small rural towns are very picky about towers – town pride.. bla, bla…. It can take years to negotiate just one or 2 towers.. silly.. I was in Delano Saturday and yes I can confirm that there is LTE there. Pretty much everywhere I went I had LTE. Any word on Coarsegold or Oakhurst being upgraded? Do you think we will ever be able to make a call or send a pic message from the Yosemite Village? San Joaquin, Tranquillity and Kerman among them? I love reading all the stories about network upgrades but I’m very surprised i have not seen or heard of network upgrades for the 2g network in Minnesota. This is a really big market for T-mobile and has a lot of 2g area that is in need of some upgrades. I use to live in Fargo, ND. When I was going to NDSU I met a lot of students from The Cities complaining about being stuck with 2G on T-Mobile. A lot of them ended up switching to Sprint or Verizon since both offer LTE in Fargo. I’m really surprised t-mobile hasn’t turned on LTE in Fargo/Moorhead since there are 3 universities within a 10 mile radius. What about East Dallas? We sure have plenty of 2G to go around. Especially in (75126) up north is where it needs major improvement. Considering Dallas is extremely well covered in LTE your phone must have something wrong… even East Dallas should have 4×2 MIMO 20×20 LTE. How about some live for Waco and the tri-cities (Belton, Temple, Killeen)? These are major cities along I35 with no LTE. At least you got 3G. But just North of Waco in West there’s no signal at all. How’s one supposed to stop at the Czech Bakery and be without any signal? That explains my piss slow speeds with Brightspot. I get .2 down with full coverage outside. Lots of hope for the future though. Yeah they are starting to roll upgrades next week. On north side of Hillsboro they already got LTE. Elm Mott and Lacy Lakeview got hspa recently. There are supposedly 22 towers in Waco and surrounding areas. Scheduled for July 30. This by a talk I had with a friend that works at a tmo store..
Ellis “Speed Trap” County, just a few miles north of Hillsboro, the connection drops to EDGE or worse. This along the busy I35 corridor some 50mls from Dallas. Yes the highways have always been an issue. Well whenever I travel I35 E the first suburb with LTE is Waxahachie like 30 miles south from Dallas. Really, there’s no excuse to run a 2G network nowadays. Running a twice-removed generation when backhaul cost is much lower is a sore point in the otherwise fine TMUS network. ATT and VZW provide LTE coverage virtually all of the I35 corridor in TX. Augustine, when was the last time you were in West? I was there about 6 weeks ago and the entire town (including Czech Bakery) had ZERO data coverage. It’s been like this for months (was GPRS previously). A friend of mine works for T-Mobile and got me in touch with the engineers for that area and I informed them that its been dead for a long time. Have you been there recently to see if they’ve fixed the problem? It was longer than 6 weeks, maybe 8 weeks ago, but, since my daughter moved to Dallas a few years ago, I’ve done this route umpteen times and West has always been a virtual dead zone. The site survey maps by both Root Metrics and Sensorly confirm this. I know I’ve had GPRS there at some point in the past, I wonder if it was coming from a nearby tower? Hopefully they fix it. They said West was part of the Waco market, which is currently being transitioned to LTE. Hopefully they throw some LTE on the West tower. It would be nice to eat a kolache and check email/Facebook. How about south east San Diego county?? Any word or rumor?? Big city and drops to 2G, or to no signal at all, once you head east. Awesome hope more info about more states is released soon. Texas is huge though and a decent place to start for rural coverage people actually care about. Sprint merger will probably stop all of this work. If they merge with Sprint, everyone is coming to the T-Mobile network because our bands are standard. The most they’ll do is bring 800MHz and some urban 2.5GHz. All Sprint’s PCS stuff would probably go because it isn’t compatible with T-Mobile PCS holdings. There’s no reason to stop work because we are the ones who are compatible with every other network in the US. Sure there is.. because the combined company would be broke and in debt to it’s eyeballs.. These upgrades are not cheep.. the last earnings call they basically said they were negative because of the fast and hard upgrades they were pushing and to expect it to continue through 2014. If they got hit with Sprint / SoftBank debt.. pffff.. yeaaah.. Safe bet much of it would stop so they can scratch their heads and wonder how to stop hemorrhaging customers..
That’s where daddy SoftBANK comes in to help. Plus, if T-Mobile is ditching Sprint’s PCS spectrum and most of 2.5 GHz (the FCC would probably make them divest it anyway) then there’s going to be a good amount of money coming from that. Sprint will not ditch a lot of 2.5 ghz. It’s the foundation of the new network they’re deploying. Interesting times for both companies. I just hope they make the most of it if they do merge. Glad Texas is getting some love, maybe T-Mobile can come back to NC. The coast is bare. There are so many cities that don’t even have EDGE coverage. The Piedmont region is looking better every month where I live. Statesville and Hickory got 4G coverage in a week and a half. Go T-Mobile!! 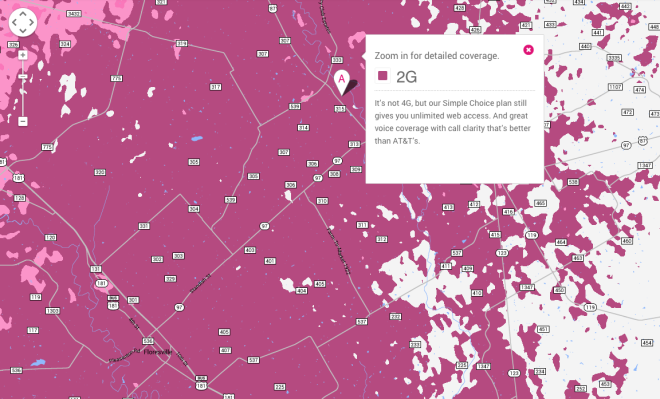 good for Texas, but hopefully soon T Mobile will release more info for MICHIGAN in the rural part and Northern & Upper part of Michigan, since the other half of Michigan needs coverage, since there is no coverage, BUT the south part of Michigan does have coverage !!!! The biggest thing for me is the upgrade between Nashville and Northern GA and Nashville and Southern KY. I take a trip to Bowling Green at least three times a year and I spend most of it on GPRS while my friend is connected to Verizon LTE the entire time. I’m glad that progress is being made. Upgrading the towers and output may be also increasing range.. and some states / counties require if you change from one type of technology to another with your spectrum that it be registered.. They can be very strict.. even if it’s the same spectrum.. they want to stay informed. Every rural upgrade reported so far uses band 4 (AWS) for LTE, so it seems like they’re continuing with that trend. But, this also might be for 700A, which should require more drastic changes. Some places require permits for any work being done on infrastructure/utilities and phone lines. Locally it prob falls under these areas. Fine, so the area east of S Antonio is getting upgraded from 2G. How about the important I35 corridor south of S Antonio, where the connection drops to 2G as soon as one leaves the metropolitan area all the way to Laredo on the border? At least it’s basically full EDGE or GPRS the entire time. Makes the statusbar look a little prettier. Or, how about adding native coverage between El Paso and San Antonio? Long stretch of highway with nothing but roaming. Everyone else has LTE. 4G as in HSPA/HSPA+ or real 4GLTE? Yes I know T-Mobile had 42Mbps in certain areas but many times with little backhaul to support these speeds particularly in non urban areas. I haven’t experienced blazing speeds here in Houston. Just saying… I average about 15-20Mbps download. Hooray for Texas. Please for the love of all that is good do something with the coverage along I-65 between Chicago and Indianapolis. It’s brutal…2G if you’re lucky between Merrillville and Indianapolis, other than a small 4G cell around Lafayette. Just made that drive on Weds. and there is nothing at all in spots. Not even voice. I am along this route all the time. I can never get EDGE to work. Very frustrating. I have noticed that I am getting LTE past Merrillville now when it typically dropped off sooner. You’re right. This was my first trip with an LTE device, having just upgraded from an S3 to an S5, and I lost coverage about 20 miles south of Merrillville instead of in Merrillville like before. It’s pretty sad when I have to bring my employer-owned VZW hotspot device with me on this trip and connect my T-Mo phone to it for WiFi calling so I have reliable voice in case I need it. I get 20mbs – 40mbs down in Fort Wayne Indiana. Went to Columbus to the airport and for a few I had over 45mbs and plus. This seems exciting because I plan on becoming a tmobile customer once the iphone 6 is released. If I can get data on 71 south and 65 south from Ohio all the way down to Tennessee and in-between Tennessee and Georgia I will gladly switch to T-Mobile. Backhaul is the biggest challenge in these upgrades. In some of these places, it was hard enough to get a T1. Now you have to try to get a 100 MB/s Ethernet circuit. I’ve heard of this, but don’t fully know how this works compared to T1/Fiber backhaul. How is Microwave backhaul even possible? I don’t know but I assume you would have a main node that would be hooked up to fiber, with several or one microwave dish that links that tower to other towers. Not sure how many towers can be daisy chained before performance starts to degrade but I assume that it would not take long. This is how Verizon deployed LTE in Northern New Mexico. They couldn’t wait for backhaul from CenturyLink and Windstream. Verizon was the only LTE carrier until about two months ago when T-Mobile lit up Santa Fe. Sprint is still waiting on backhaul and AT&T just has HSPA+. Verizon’s LTE speeds are not great anymore. Before I switched to T-Mobile, I got 0.58 Mbps with all my bars on Verizon LTE. Now with T-Mobile, I can pulll 25 Mbps with LTE and 19 Mbps with HSPA+. Love what tmobile is doing but will not switch unless they get lte. In florsville right now and have full bars lte with att. Live in Karnes, and get hspa+ and lte sometimes. Tmobile has 2g everywhere even in beeville. All other carriers have lte. Well our att bill went from $250 to $180 with new plans att came out with to compete with tmobile. Might be tempted to get tablet from tmobile since it is free data but will wait for lte. Drove from Chicago, IL to Port Huron, MI and back this past week, on I94 and I69. I couldn’t believe how poor my reception was. A few places had LTE coverage (usually passing through main cities like Kalamazoo or Flint, MI), but it was short and lasted a few minutes. The balance was 3G or HSPA in those same cities. A lot of EDGE (E) and GPRS (G), and sadly about 4-5 areas with NO SERVICE that are on each of the I94 and I69 highways (confirmed on two devices, Nexus 4 and 5). There is about a $15 price gap between what I pay now and what I can with AT&T for 2-lines. With the poor reception I get in suburban Chicago areas, with EDGE or NO SERVICE, I may switch and pay the extra for a reliable service with AT&T. Otherwise, T-Mobile will need to step it up by end of the year when my contract is out. Unfortunately the reality with T-Mobile is that it’s the carrier to stick with IF you’re only going to be in the cities. I’m hoping by 2015 though those gaps will be filled. Heck, they don’t even have to convert ALL 2G towers to LTE. If they could just get the highways I’d be okay with that. If T-mobile really wants to make a huge dent in rural reception- blanket the entire I-90 from Logan airport in Boston to Seattle in 4g, granted in the cities you have great 4g or even lte coverage, but once enter the tress its all 2g, Hell wanna impress the masses Tmobile, Blanket I77 from Columbia, South Carolina to Cleveland, Ohio in 4G lte the whole way. I remember last summer on a road trip i went on the entire state of West Virginia I was on 2G Att, while my friends verizon phone said no service Upstate New York all 2G, Granted its takes time, but If Legree and Neville was daring enough to take a cross country road trip on I-90 I think they would be stunned on how crappy reception is. If Tmobile can cover entire major highways that has huge stretches of rural areas in between the cities and keep prices the way they are Tmobile could become a real force to wrecking with.